His Holiness Pope Tawadros II, 118th Pope of Alexandria and Patriarch of All Africa on the holy Apostolic See of Saint Mark, accompanied by a papal delegation, arrived in Russia on 28 October 2014 ahead of a historic visit. HH Pope Tawadros will visit His Holiness Patriarch Kirill of Moscow and All Russia on 29 October 2014, marking 26 years since the visit of the previous Pope of Alexandria, His Holiness the late Pope Shenouda III, who had participated in the celebration of the Millennium of the Christianisation of Russia and the baptism of St Vladimir. His Holiness was met at Moscow’s Domodedovo airport by His Eminence Metropolitan Hilarion of Volokolamsk, Chairman of the Moscow Patriarchate Department for External Church Relations in Moscow and His Excellency Dr Mahmoud El-Badry, Ambassador of the Arab Republic of Egypt to the Russian Federation, as well as Their Graces Bishop Kyrillos of Milan, Papal Exarch in Europe, and Bishop Angaelos, General Bishop of the Coptic Orthodox Church in the United Kingdom. 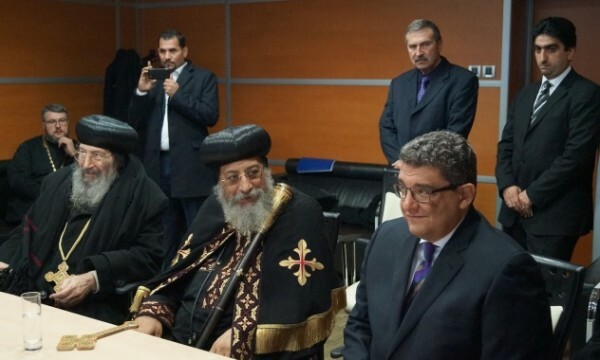 Accompanying Pope Tawadros is a delegation comprising Metropolitan Bishoy of Damietta and Their Graces: Bishop Raphael, General Secretary of the Holy Synod of the Coptic Orthodox Church and Bishop Serapion of Los Angeles and Papal secretary Father Angelos Ishak and official spokesman of the Coptic Orthodox Church, Fr Boulos Haleem. Pope Tawadros will be received at the Egyptian Embassy on the evening of the 28 October 2014, and will undertake various official visits and pastoral engagements throughout the duration of his stay.